Back in October, LinkedIn unveiled a new design for its flagship mobile app for iOS and Android — which they named ‘Voyager.’ Now, the update is available globally, offering a pared-down experience that tries to be more relevant (and more sticky) than the previous version. Primarily, Voyager is about decluttering the somewhat confusing previous version of the LinkedIn app and giving users simple, actionable experiences that don’t require rooting around in random menus. And, for the most part, it works. There are clear designations set up by the company: the ‘Home’ news feed that provides relevant information when I first tap in, the new informal ‘Messages’ platform, the ‘My Network’ tab that keeps me updated on people I know or may know, and the important ‘Search’ function. I can go to these tabs, tap through to see what’s what, and spend less time thinking about what to actually do with the app. The new app also fully realizes our multi-app strategy by bringing more focus to the main flagship app. And with the new app launcher feature, it’s incredibly seamless to launch into other LinkedIn apps for dedicated and deeper experiences, like Pulse, Groups, Job Search, etc. LinkedIn actually excels at providing a suite of purpose-focused apps — I’m a fan of Job Search, in particular — so Voyager acts as a landing spot without feeling bloated. It’s definitely a bigger undertaking than Facebook’s spin-out of Messenger, but given the situational purposes of LinkedIn’s app suite, it’s helpful to remember exactly what the company offers. But the issue with LinkedIn is that it’s always been situational: it’s hard to see why your professional network needs room on your phone if you’re not in the core businesses of recruiting, sales, public relations and entrepreneurship. Voyager, for its part, does make the app stickier and more attractive to the average user, but it still lacks the kind of tools that would really make the mobile experience pop in an intriguing way. 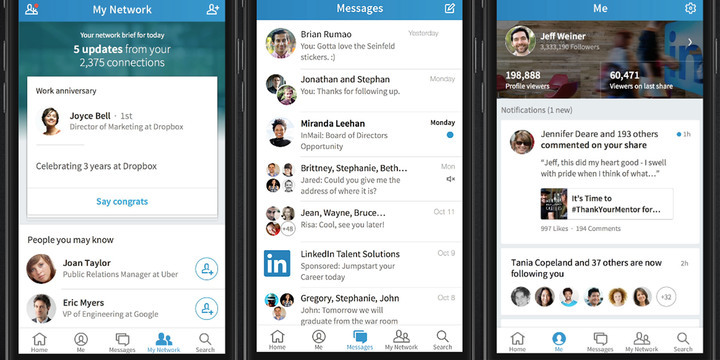 Regardless, Voyager brings LinkedIn’s app into a new era, and one that looks and functions attractively. Get it for free in the App Store and Google Play.